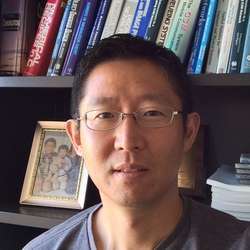 JOSEPH H. KANG is a researcher at Bell Labs in Murray Hill, New Jersey where he has been working on the design and analysis of advanced algorithms and protocols for cellular and ad hoc communication networks. He received B.S. and M.Eng. degrees in electrical engineering from the Massachusetts Institute of Technology and a Ph.D. degree in electrical engineering from the University of Michigan, Ann Arbor where he held university fellowship and research assistant positions. He is a senior member of the IEEE with over fifty issued and pending patents, over thirty papers in refereed publications, and numerous contributions to 3GPP and 3GPP2 wireless standards. He has received a number of awards including the Bell Labs Presidents Award and two Bell Labs Teamwork Awards. His current research interests are in the fields of cooperative communications, heterogeneous networks, interference cancellation, channel estimation techniques, and dynamic spectrum access protocols. Member of Alcatel-Lucent Technical Academy (ALTA), 2009. Bell Labs Presidents Award, WiMAX - Technologies and Innovations, 2007. Bell Labs Teamwork Award, Public Safety Broadband Wireless Communications, 2007. Bell Labs Teamwork Award, WiMAX, 2006. Have served as reviewer and/or TPC member for various IEEE publications (e.g., Trans. Wireless Comm, Trans. Comm., JSAC, ICC, GLOBECOM, VTC, WCNC). K. Balachandran, J. Kang, K. Karakayali, K. Rege, “Base Station Cooperation with Non-Ideal Backhaul and Non-Full Buffer Traffic," submitted to IEEE VTC, March, 2014. K. Balachandran, J. Kang, K. Karakayali, K. Rege, “Virtual Soft Handoff with Resource Blanking in Heterogeneous Networks," IEEE ICC, June 2014 (to appear). K. Balachandran, J. Kang, K. Karakayali, K. Rege, “A Practical Dirty Paper Coding Scheme Based on LDPC Codes," IEEE WCNC, September 2013. K. Balachandran, J. Kang, K. Karakayali, K. Rege, “Dirty Paper Coding using Trellis-Coded Modulation," IEEE PIMRC, September 2013. K. Balachandran, J. Kang, K. Karakayali, K. Rege, “Dirty Paper Coding using Sum Codes," IEEE PIMRC, September 2013. K. Balachandran, J. Kang, K. Karakayali, K. Rege, “Network-Centric Cooperation Schemes for Uplink Interference Management in Cellular Networks," Bell Labs Technical Journal, September 2013. K. Balachandran, J. Kang, K. Karakayali, K. Rege, “Virtual Soft Handoff-Enabled Dominant Interference Cancellation for Enhanced Uplink Performance in Heterogeneous Cellular Networks,” IEEE WCNC, April, 2012. K. Balachandran, J. Kang, K. Karakayali, K. Rege, “Uplink Performance Enhancement in Cellular Networks via a Generalized Network Interference Cancellation Scheme,” IEEE WCNC, April, 2012. K. Balachandran, J. Kang, K. Karakayali, K. Rege, “An Analysis of Uplink Base Station Cooperation with Practical Constraints,” IEEE Transactions on Wireless Communications, March 2012. K. Balachandran, J. Kang, K. Karakayali, K. Rege, “Seamless Macro-Cell Anchored Radio Transmission for Enhanced Downlink Performance in Heterogeneous Networks,” IEEE ICCN Workshop on Cooperative Heterogeneous Networks, July, 2011. K. Balachandran, J. Kang, K. Karakayali, K. Rege, “Cell Selection with Downlink Resource Partitioning in Heterogeneous Networks,“ IEEE ICC Workshop on Heterogeneous Networks, June 2011. K. Balachandran, J. Kang, K. Karakayali, K. Rege, “NICE: A Network Interference Cancellation Engine for Opportunistic Uplink Cooperation in Wireless Networks, ” IEEE Transactions on Wireless Communications, February, 2011. K. Balachandran, J. Kang, K. Karakayali, K. Rege, “Uplink Cooperation in Wireless Networks with NICE Processing,” IEEE GLOBECOM, Broadband Wireless Access Workshop, December, 2010. K. Balachandran, J. Kang, K. Karakayali, K. Rege, “Performance Enhancement of Single Frequency Networks Using Randomized Transmit Phases,” IEEE GLOBECOM, December, 2010. K. Balachandran, J. Kang, K. Karakayali, K. Rege, “A Distributed Beam-Forming Algorithm for Single Frequency Networks Supporting Broadcast and Multicast Applications,“ IEEE WCNC, April, 2009. K. Balachandran, N. Gopalakrishnan, J. Kang, S. Li, S. Ramakrishna, A. Rudrapatna, “Design and Performance Analysis of Collaborative UL-MIMO in IEEE 802.16e/WiMAX,” Bell Labs Technical Journal, Vol. 13, No. 4, Winter, 2009. K. Balachandran, J. Kang, K. Karakayali, K. Rege, “A Multi-Cell Space-Time-Coded Transmission Scheme for Single Frequency Networks,” IEEE Symposium on Personal, Indoor, and Mobile Radio Communications, September, 2008. K. Balachandran, J. Kang, K. Karakayali, J. Singh, “Capacity Benefits of Relays with In-band Backhauling in Cellular Networks, IEEE International Communications Conference, May 2008. M. Karakayali, J. Kang, K. Balachandran, M. Kodialam, “Joint Resource Allocation and Routing for OFDMA-Based Broadband Wireless Mesh Backhaul Networks,” IEEE International Communications Conference, June 2007. M. Karakayali, J. Kang, K. Balachandran, M. Kodialam , “Cross-Layer Optimization for OFDMA-Based Wireless Mesh Backhaul Networks,” IEEE Wireless Communications and Networking Conference, March, 2007. K. Balachandran, D. Calin, F. Cheng, N. Joshi, J. Kang, A. Kogiantis, K. Rausch, A. Rudrapatna, J. Seymour, R. Sun, “Design and Analysis of an IEEE 802.16e-Based OFDMA Communication System,” Bell Labs Technical Journal, Winter, 2007. K. Balachandran, D. Calin, N. Joshi, J. Kang, A. Kogiantis, “Zone Based Resource Allocation for OFDMA Systems,” IEEE Vehicular Technology Conference, September, 2006. K. Balachandran and J. Kang, “Neighbor Discovery with Dynamic Spectrum Access in Adhoc Networks,” IEEE Vehicular Technology Conference, May, 2006. K. Balachandran, K. Budka, T. Chu, T. Doumi, and J. Kang, “Mobile Responder Communication Networks for Public Safety,” IEEE Communications Magazine, January 2006, vol. 44. K. Balachandran, K. Budka, T. Chu, T. Doumi, J. Kang, and B. Whinnery, “Converged Wireless Network Architecture for Homeland Security,” IEEE Military Communications Conference, October, 2005. K. Balachandran, W. Lau, and J. Kang, “Adaptive Sleeping and Awakening Protocol (ASAP) for Energy Efficient Mobile Adhoc and Sensor Networks,” IEEE International Conference on Communications, May, 2005. K. Balachandran and J. Kang, “Dynamic Channel Assignment for Systems with Constrained Downlink Power Control,” IEEE Symposium on Personal, Indoor, and Mobile Radio Communications, September 2004. K. Balachandran, K. Budka, T. Doumi, and J. Kang, “Third Generation Wireless Services for Homeland Security,” Bell Labs Technical Journal, Vol. 9, No. 2, 2004. K. Balachandran and J. Kang, “Enhanced Frequency Hopping for Deployments with Limited Spectrum,” IEEE Vehicular Technology Conference, April 2003. K. Balachandran, T. Ji, and J. Kang, “Performance Analysis of Channel Rate Selection Schemes in Systems with Tight Reuse,” IEEE Vehicular Technology Conference, April 2003. J. Kang and W. Stark, "Iterative Estimation and Decoding for FH-SS with Slow Rayleigh Fading," IEEE Transactions on Communications, December 2000, pp. 2014-2023. J. Kang and W. Stark, "Turbo Codes for Noncoherent FH-SS with Partial Band Interference," IEEE Transactions on Communications, November 1998, pp. 1451-1458. J. Kang, W. Stark, and A. Hero, "Turbo Codes for Fading and Burst Channels," IEEE Conference Theory Mini Conference, GLOBECOM, November 1998, pp. 40-45. J. Kang and W. Stark, "Performance of Turbo-Coded FH-SS with Partial-Band Interference and Rayleigh Fading," Proceeding of the 1998 IEEE Military Communications Conference, October 1998, pp. 977-981. J. Kang and W. Stark, "Performance of Turbo-Coded FH-SS with Partial-Band Interference," Proceeding of the 1998 IEEE International Symposium on Information Theory, August 1998, p. 456. J. Kang and W. Stark, "Turbo Codes for Coherent FH-SS with Partial Band Interference," Proceeding of the 1997 IEEE Military Communications Conference, November 1997, pp. 5-9. "Partitioning Resources with Soft Reuse in a Wireless Network," January 28, 2014, #8638661. "Broadcast and Multicast in Single Frequency Networks using Orthogonal Space-Time Codes," August 20, 2013, #8514693. "Ranking and Grouping of Transmission in Communication Systems," November 27, 2012, #8320479. "Method and Apparatus of HARQ Process Selection," October 23, 2012, #8296617. “Method of Quality-Based Frequency Hopping in a Wireless Communication System,” August 14, 2012, #8243779. “Method and Apparatus for Mobile Broadcast and Multicast Using Randomized Transmit Signal Phases in a Single Frequency Network,” August 14, 2012, #8243637. “Method of Jointly Assigning Resources in a Multi-Carrier, Multi-Hop Wireless Communication System,” awarded September 27, 2011, #8027290. “Methods Of Discovering Neighbors In Opportunistic Open Access Wireless Networks,” awarded September 20, 2011, #8023552. “Methods and Devices for Selecting Sets of Available Sub-channels,” awarded August 2, 2011, #7990931. “Push-To-Talk Group Call System Using CDMA 1x-EVDO Cellular Network,” awarded June 28, 2011, #7970425. “Method of Resource Allocation in a Wireless Communication System,” awarded May 25, 2011 (KR), #101038230. "Adaptive Method Of Floor Control With Fast Response Time And Fairness In Communication Network," awarded January 18, 2011, #7873067. “Methods and Devices for Selecting Sets of Available Sub-channels,” awarded April 20, 2010, #7701909. “Method for Tracking Users in a Communication Network,” Div. Under Rule 1.53b, awarded January 20, 2009, #7480508. “Methods for Receiving Signaling Information in a Communication Network Supporting a Broadcast-Multicast Service,” awarded November 18, 2008, #7454165. “Methods for Signaling Broadcast and Multicast Information in Communication Networks,” awarded July 22, 2008, #7403790. “Method of Transmitting Broadcast-Multicast Services Parameters Messages in a Wireless Communications System,” awarded May 13, 2008, #7372823. “Adaptive Sleeping and Awakening Protocol for an Energy-Efficient Adhoc Network,” awarded April 8, 2008, #7356561. “Method of Quality-Based Frequency Hopping in a Wireless Communication System,” awarded February 13, 2008, #1717962 (EP Patent Office). “Method for Tracking Users in a Communication Network,” awarded August 21, 2007, #7260396. “Channel Rate and Physical Channel Selection in Wireless Communications Networks,” awarded June 26, 2007, #7236789. “Systems and Methods for Providing Adaptive Pulse Position Modulated Code Division Multiple Access for Ultra-Wideband Communications Links,” awarded March 6, 2007, #7187715. “Methods and Systems for Assigning Channels in a Power Controlled Time Slotted Wireless Communications System,” awarded October 3, 2006, #7116982. “Systems and Methods for Providing Variable Spacing Pulse Position Modulation for Ultra-Wideband Radio Links,” awarded July 25, 2006, #7082153. “Enhanced Frequency Hopping in a Wireless System,” awarded May 30, 2006, #7054346. "Method and Apparatus for Improved Multi-Carrier Communication," filed April 21, 2014. "Method and Apparatus for Coordinated Uplink Scheduling," filed December 18, 2013. "Methods of Receiving a Signal in a Wireless Communication Network and Associated Network Elements," filed October 15, 2013. "Methods and Apparatus for Reducing Interference Effect on Data Transmitted over a Communication Channel," filed September 13, 2013. "Methods and Apparatus for Reducing Interference Effect on Data Transmitted over a Communication Channel," filed March 29, 2013. “Method and Apparatus for Inter-Carrier Load Balancing,” filed July 26, 2012. “Method and Apparatus for Improved Signal Processing in Wireless Networks,” filed July 26, 2012. “Network Node and Method for Virtual Soft Handoff Operation,” filed January 25, 2012. "Seamless Macro-Cell Anchored Radio Transmission for Enhanced Downlink Performance in Heterogeneous Networks," filed May 13, 2011. “A Hybrid Network MIMO-Successive Interference Cancellation Scheme for Uplink Performance Enhancement in Cellular Networks,” filed September 17, 2010. “A Network Interference Cancellation Engine to Opportunistically Improve Uplink Transmission Rates in Wireless Networks,” filed November 20, 2009. “A Method and Apparatus for Mobile Broadcast and Multicast Using Randomized Transmit Signal Phases in a Single Frequency Network,” filed May 29, 2009. “Broadcast and Multicast in Single Frequency Networks Using Orthogonal Space-Time Codes,” filed July 11, 2008. “A Method to Improve Performance of Broadcast and Multicast Applications in Single Frequency Networks Using Distributed Beamforming,” submitted April 28, 2008. “Method Of Establishing And Maintaining Distributed Spectral Awareness In A Wireless Communication System,” filed September 19, 2005.